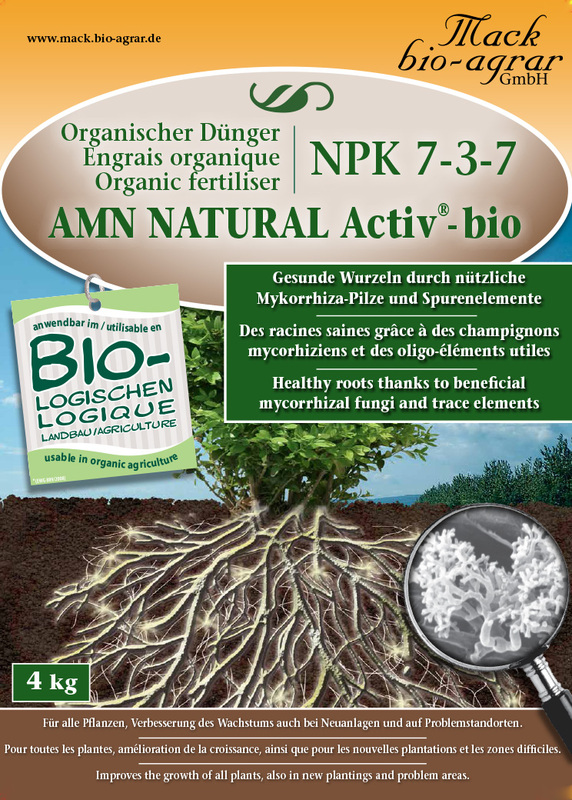 This recipe connects our three flexibly applicaple products AMN Natural ActivÂ® - bio, AMN FusekÂ® and AMN PowerFertiliserÂ®.With this recipe it is possible to care for all your plants in an organic sustainable as well as cost effective way. The focus is to gain healthy and optical attractive plants growing in vital and fertile soil in best organic quality. Vital and strong plants through a special fertiliser placed in depots close to the plant's roots. This system saves you time and money in the garden. It was developed for our granular fertiliser and soil activator AMN Natural ActivÂ®- bio. Our innovative AMN B.O.R.N.Â® fertilisation system places a depot or strain of concentrated organic fertiliser in proximity to the plantsâ€™ roots or alternatively in a specially prepared hole. The plants form a dense root system around this depot and incorporate the fertiliserâ€™s nitrogen developed especially for this purpose (AMNÂ® Natural Activ-bio). Due to this depot, the plant is able to convert the nitrogen of the fertiliser into ammonium instead of nitrate. This results in sturdier and more stress-tolerant plants. Ammonium nutrition is more efficient. The plant saves energy in metabolising as it regulates its individual food requirements dependent on factors such as light, temperature and water uptake. Hence, the plant uses its saved energy to build stronger cells, which in turn have the advantage to be more resilient against pests and diseases. This means increased marketability of your plants as longer shelf life is possible. Extract from our recipes for specific plant cultures or applications. Please contact our consulting team if your plant culture or problem field is not covered.